My name is Andrea Benvegna, I’m Italian and my role here at the Mandrake is assistant bar manager. I was basically born behind a bar. My parents both worked in hospitality, near the french border in Liguria and my father is still shaking drinks and making clear ice at his bar. I started my career in London in 2011, after I gave up being a graphic designer in Italy. On my list of best bars in London, the Connaught was at the top. 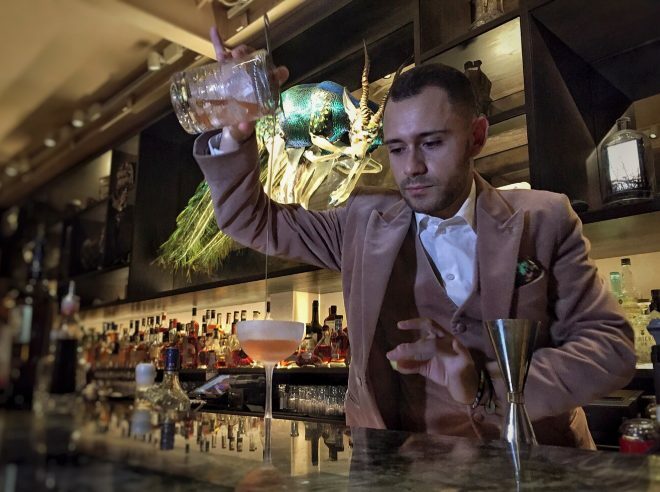 I used to watch a lot of videos from there and my dream was to work next to Ago Perrone one day, as for our generation he is the number one Italian bartender. So I went to drop my resume there and Ago looked at me and said: “Andrea, take your coat off and jump behind the bar”…and that was it. That’s what is magical about London, if you want to do something, you can. I stayed five years at the Connaught, and that place and especially the team will always be deep in my heart. After the Connaught I had an offer to work in New York City on Park Avenue, which was my first managing experience. It helped me to focus less on the drinks and more on the experience and hospitality. I missed Europe, so after one year I took a month off, then Walter Pintus called me. I didn’t know what to do, but I was free so I said ok let’s see how things work out. When I walked into this place, I fell in love with everything, both the place and the people. Then Walter asked me when I wanted to start and I had the same feeling I’d had six years before at the Connaught. I started here straight away. This place is amazing not only because of the incredible art, but also it’s about life and the energy you feel here and that’s what we share with our guests every day. My dream bar is here. The bar has just been created and we are lucky to have the Lamborghini of bar stations. It’s set-up so well, it’s a real work of art, a beauty. It’s really important to have a great bar team that work well together and we have that here. The bar is in London, which happens to be my favourite city in the world with a completely global community. Honestly I don’t want to change anything, but if money was no object I’d open more Waeska Bars in Bali, China and Cuba. In hospitality, there is a fine line between work and your personal life. When you are born into hospitality like I was, this line doesn’t even exist. I love gin, maybe because I’m based in the country of gin and I was heavily influenced during my time at the Connaught by their gin martinis. I like the fragrance of gin, it’ so elegant. My favourite gins are the ones with a a lot of juniper, it makes me think of a man with big shoulders, wearing a tuxedo. You just need passion, this will make the difference to the outcome of the drink. Today my favourite ingredients are roots and plants related to elixir. I read a book about ethnobotany which is basically the study of a region’s plants and their practical uses through the traditional knowledge of a local culture and people. So I want to adapt this knowledge to the cocktail world and that’s what we are doing here at the Mandrake. I had a great experience in New York with an Italian of course, Salvotore from Loyal on Bleeker Street, he’s a great host. In Singapore, you must visit 1880 a private club where Rusty Cerven works now and he’s an amazing and knowledgeable person. And last, but not least Walter Pintus who works right here at Waeska Bar as bar manager.